← Springtime in Denver..Yeah Right! Home » Uncategorized » HEY HEY VA!! So….here we go. Another spoke in the big wheel of playing therapeutic healing music for patients. This time it’s the VA facility here in Denver and another step in trying to bring a little joy and ease the pain for those who have done so much for us for so little thanks. Honestly, it feels like a very strange tradeoff, walking into a patients’ room with my guitar and offering to play my little tunes to someone who put his life on the line in a strange country in order to make folks like me feel safer here at home. On top of that, with all the negative news that has swirled around the VA this last couple of weeks, I begin to wonder if my timing isn’t totally upside down and after all, shouldn’t listening to someone play “healing” music be a little further down the priority list in the minds of these patients right now? Oh well, I hope Tennyson wont mind if I steal some of his lines and go forward with the idea that, “Ours not to reason why, ours but to do or die” might be in order. I’m not sure if that’s exactly what Tennyson wrote or had in mind but you’ll get the idea. One thing is for sure, my feelings in all of this don’t amount to much. These men (and women) have put a hell of a lot more on the line than I have, and one thing seems common in a great many of them. In times of loneliness or heavy stress, many will turn to music just to ease the inner pain, or maybe just pull away from reality a little bit. Some will put the head phones on to escape, others will pick up the closest instrument that’s handy to bang away on a little bit, and still others might find their own form of escapism in writing their feelings down in song form on a piece of paper. Any way you look at it, it’s music, it’s therapeutic, it helps them through a long day and I’m going to use it to help in every way I can! They are local, at 6446 E. Hampden Ave. Suite 250, Denver CO and the contact person is Sarah @ 720 279-8044. 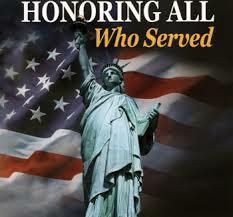 This is an organization trying to do the right thing for Vets and they are worthy of your support. While we’re at it, allow me to say a huge THANK YOU to all those of you who have contributed so generously and allowed me to get started on this journey. To all those of you who are thinking about donating some money to this worthy cause, please allow me to say thanks in advance for anything you can do. IT WILL BE APPRECIATED! 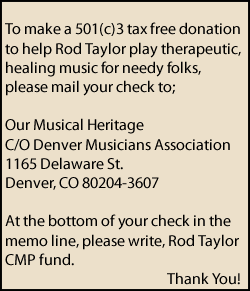 At the bottom of your check in the memo line, please write, Rod Taylor CMP fund. That’s it! Have a great week everybody! Send me those comments and critiques. If I can use them I certainly will.